Training plays a vital part in optimising athletic performance. It must be of adequate volume and high enough quality to not only improves performance, but also to keep the athlete injury free. Over the past few years, scientific research has tried to better understand the relationship between training load and injury. The likelihood on injury increases due to two main reasons; underloading and overloading. The athlete has not completed enough training (volume and/or intensity) to meet the demands of their sport. A front row forward (rugby) has only been completing tackle bag drills in training for the past 4 weeks due to an injury. The athlete is asked to compete in a week-long tournament but has not been exposed to tackling opponents in training or part of game play.In this example the training load is not specific (volume/intensity) enough to the requirements of a game with the athlete underprepared for repetitive tackles as part of a game or the decision-making process of game play. The athlete needs to have greater exposure to tackling opponents in training and in game play scenarios and steady exposure to games from the bench. The athlete undergoes a period of rest (rehabilitation, holidays etc) and then resumes high intensity training/games quickly A cyclist in on holidays for two weeks over Christmas without doing any riding. Upon returning in the New Year they recommence intensive training – combination of long rides and high-speed sessions – to catch up for the break over Christmas.In this example the athlete has resumed training at a level greater than their safe capacity. They have done too much, too soon. Their training needs to gradually increase to reflect the break over Christmas where their chronic fitness reduced. 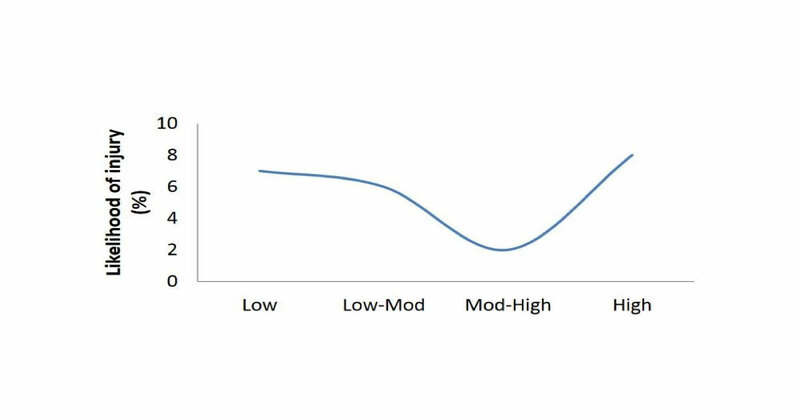 An athlete combines additional spikes in training on top of an already high chronic training load. A footballer (soccer) is invited to a week long intensive training camp at the AIS. They are currently training 3 nights per week and a game on the weekend. During the week away, they train twice a day for 5 days as part of a series of clinics with games included. Upon returning from training camp they are required to play for their club and complete usual intense training sessions.In this example the training camp has become an additional spike in load. The athletes training upon returning needs to be reduced (less sessions or less intensive) to allow the athlete to recuperate from the camp. It is important to understand that injury risk may be elevated for up to 4 weeks following an acute spike in training load. We call this the latent period. The graph below shows a large change in training load (purple) and the period after this training error (boxed region). The red bar represents injury. This is why when you go to see your physiotherapist they often ask you “how have you trained over the past 4-6 weeks?”. They are likely trying to establish if there have been any changes to your load that may help to explain your injury. How do we reduce the risk of injury? Maintain moderate to high chronic training loads. Be mindful that injury risk increases following periods of increased training loads. If your training/game time has noticeably increased for any reason, you may need to supplement it with some lighter sessions or cross training (pool, cycling) of lower intensity. Regular, consistent training helps to protect the body from injury. Inconsistent training loads in regards to frequency (how many sessions/week) increases the likelihood on injury. A GENERAL RULE IS THAT TRAINING LOAD SHOULD INCREASE BY NO MORE THAN 10% EACH WEEK. Maintaining a base level of fitness will allow you to make easier transitions back to intense training. Depending on your injury (location, severity etc.) you may be able to still work on a combination of your cardiovascular fitness, muscle strength and skill development whilst you are recovering. This may include cross training (swimming, cycling) or strengthening other muscle groups. The important thing is to maintain some level of load on the body, without interfering with tissue healing. The best place to start is by seeing a physiotherapist or exercise physiologist for an accurate diagnosis, advice on recovery times, and the best course of treatment. The team at Sydney West Sports Medicine have a great understanding of training load and injury management and will be able to safely guide you through the recovery process and build a return to sport program. Even if you are not injured, there are always steps that can be put in place to make you a more robust athlete, improve your performance, and make you more resilient to injury. If you want to learn more about improving your performance, contact Sydney West Sports Medicine on 02 9851 5959.